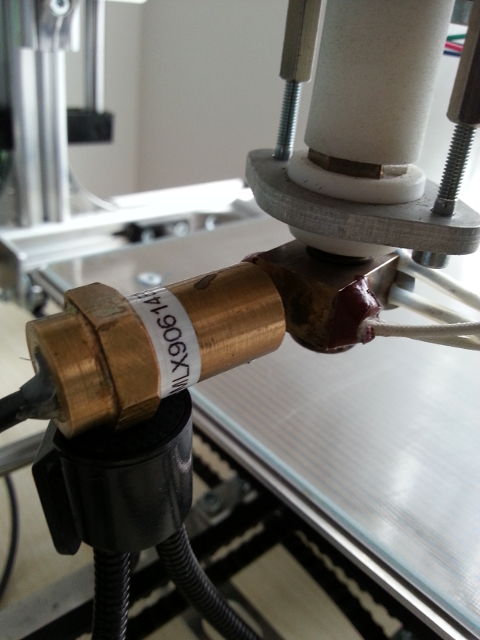 Temperature control is the key for 3D printing. The measured hot end temperature is not the temperature of the filament coming out of the extruder. 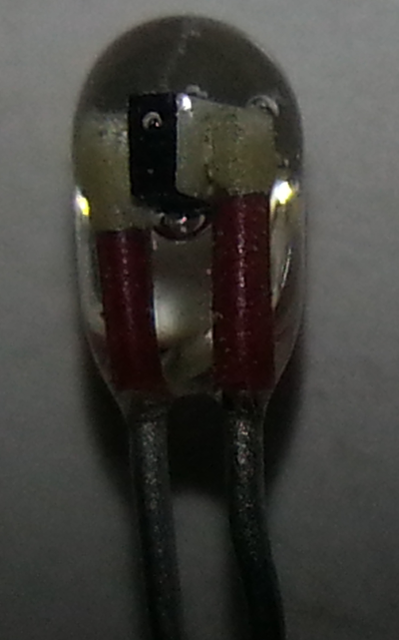 It is the temperature of the temperature sensor that is fixed to the hot end. Effects can occur as: When pressing lots of material through the extruder than the temperature of the filament might decrease. It is common to use the regulated 5V of the PCB as reference and then divided by two resistors. One of the two resistors is the NTC either on the extruder or underneath the headed bed. As NTC stands for negative temperature coefficient, the NTC reduces its resistance when getting warm. Therefore the microcontroller gets a lower voltage when the NTC is getting hot. Capacitors parallel to the NTC to remove noise. Separate precision voltage reference for the temperature sensors. 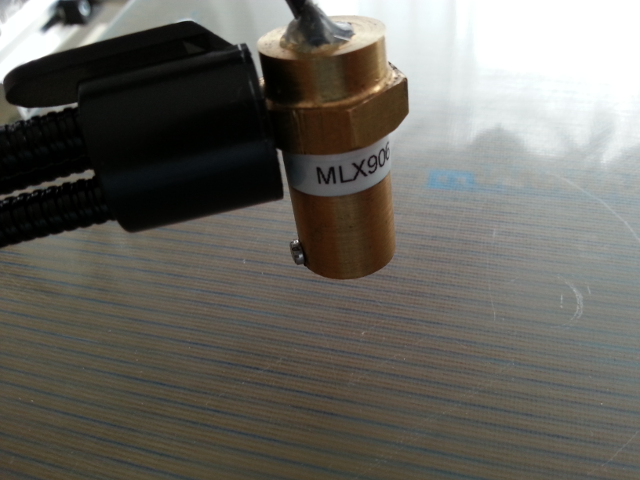 Checking the temperature of the extruder is important when the extruder motor shutters or the printing results not are very promising as when the two layers to not attach well. 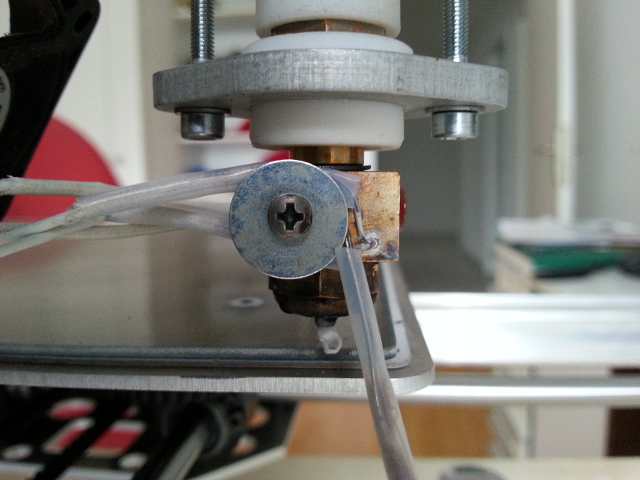 A good sign is if the filament flows easily and quickly out of the extruder. It appears that the sensor should be clean and free from melted filament. Too cold filament will put stress on the extruder motor and might produce shuttering. The extruder NTC is very small and exposed to the high extruder temperatures. The manufacturer is Futura Electronic 7350-NTC100K. It has 100K at 25°C and and a temperature coefficient of 4.5%/C. The temperature curve is not linear. Considering absolute resistance changes, it is very sensitive at low temperatures but no more sensitive at filament melting temperatures. The chart below shows an old "broken" NTC a new one and a mathematically calculated curve with 4.5% resistance decrease per °C. It appears that this tiny NTC can get bad values ("damaged") easily and has no more the correct resistance temperature behavior. A weak point might be the contacting point between wire and chip NTC resistor. It should be rated up to 250°C so even higher temperature as necessary for ABS should be supported. 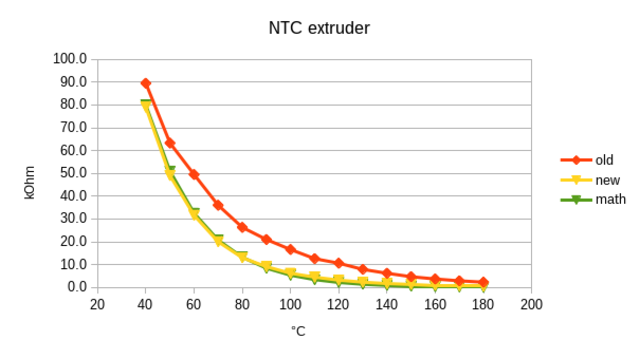 Conclusion choosing such an NTC resistor characteristics for the extruder temperature regulation is a bad choice. Spending more money having a thermocouple or spending less money and having a PT1000 would be better. An other issue is that the marlin SW Configuration.h has configured an other NTC resistor the ATC Semitec 104GT-2 that seems to have a slightly different curve. Unfortunately this device has reached end of life production. However marlin uses a temperature voltage lookup table produced using the python script createTemperatureLookup Marlin.py. Those tables end up in thermistortables.h. Temperature check of the heated bed is done best using an infrared thermometer.